Hotel OutbackNSW: book online at AccorHotels.com "
Discover the heart of Australia in outback New South Wales, an oasis of desert as well as glorious wetlands. The seemingly endless sand dunes and rock formations make for a playground of activity for adventure and nature lovers alike. Within this region includes some of Australia’s most well-known national parks, including Sturt and Mungo National Parks. 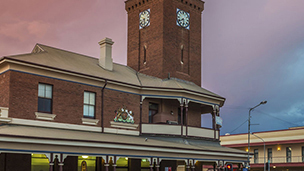 Broken Hill and Lightning Ridge are also popular local towns that make up the region, each with their own unique identity and local history. Outback NSW is home to a lineup of boisterous events throughout the year, including the Brewarrina Races, Outback Show in Bourke and the annual Broken Hill Silver City Show. Feel welcome in one of the hotels offered by AccorHotels or our partners in Outback NSW, Australia on your next business trip or relaxing family holiday. Whether it’s for one night or an extended stay, take your pick from our selection of comfortable hotels, with somewhere to match any budget.